Imagine receiving a call from your ring, removing it, and then turning it into a Bluetooth earpiece to take the call. 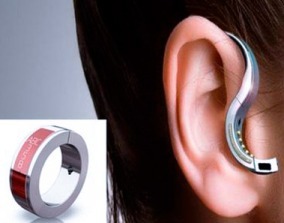 That is the simple concept of The Orb, a ring-shaped device that becomes an S-shaped device to fit into the ear. The Orb has a flexible OLED that will display the caller information, calendar items, and voice-to-text information. So the next time you receive a ring, you can look at your ring. You may notice that the opened up headset is hanging securely from the ear, but none of it is in the ear. Yeah, you don’t have to mess around with it too much, as the Orb uses bone conduction technology. Some of you have not seen bone conduction before, but it is a way of transmitting sound directly into the brain through touch. It’s a pretty simple concept, isn’t it? The best part is the Orb is not a concept, but a device that is planned for release in 2010 for about $129. The Deluxe edition is about $175. If the Orb sweeps the nation, I look forward to seeing them as wedding rings. I’m not certain the Orb is a good name for this device, as Orb implies something that is spherical, right?